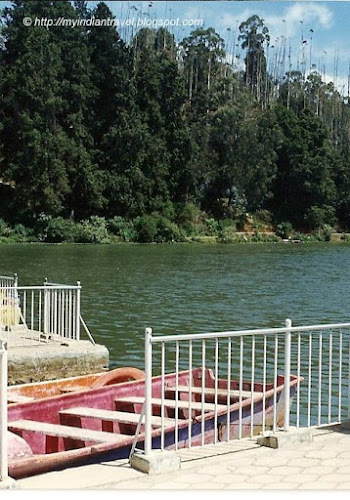 The lake located in Ooty is one of the major attractions in the city. The lake offers boating facilities to the visitors for a nominal fee. It is an artificial lake constructed by John Sullivan, in 1824. The lake is formed when the water flowing down mountain streams in the Ooty valley was dammed to occupy an area of 65 acres. The lake is surrounded by Eucalyptus trees and a railway line used by Nilgiri Mountain Railway runs along its shore. Originally it was used for fishing, but as it diminished in size, it was converted into tourist spot by the authorities to restrict encroachment of the area. The kids and adults equally enjoy the boat rides here. One can around in the lake with the choice of their boat such as Paddle boats, Row boats, and Motor boats. Also one can also see water birds in this lake. Beautiful photos on the lake! But I wish they avoid motorboats to keep the lake, and its surroundings, clean. Lovely shots - and a nice place for an outing. I like that kind of boat. A trip on the water is always enjoyable. The views from the lake look beautiful. Lovely photos of a beautiful area ~ Water in India! Riding in a choice of boats looks like a lot of fun. I bet there is lots of great nature to enjoy on a visit there. Oh, I love lakes! It is great you had the opportunity to chec this one out. Fantastic views of the lake! Ooty..a double decker when it comes to 'O'!! Hello! :) Beautiful photos of the lake and boats. What a lovely place to visit. not often one see lakes from your country. Love it! The famous place we have only seen in Hindi movies!